What an amazing and highly interesting documentary on the Royal Palace of Brussels! 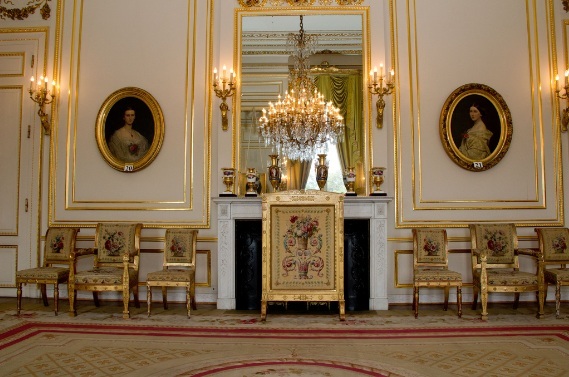 On their first day on the job, Philippe and Mathilde received their guests in the Palace in Brussels. And Minister of Pensions, Alexander De Croo, said that Philippe will be working from the Palace in Brussels. Like his uncle did. Albert used to receive a lot of guests in Laeken. Philippe and Mathilde seem to want to keep the Castle in Laeken really as their home and go to Brussels to work. From the 1st of August until the 8th of September, you can visit the Palace. good choice. you need a place to get away from work. 2 really nice pictures of the christmas tree in front of the royal palace. I visited Brussels last weekend for some Christmas shopping and saw the Royal Palace at night just as it is in *Mara*'s photos! It's such a magnificent building and the Christmas tree is enormous - the whole scene is stunning! It was very quiet outside the palace, not many people about so the whole experience was quite surreal. The first time I "saw" it was in a light fog. We'd got lost and a kind person redirected us. In minutes we were in the crowded Grand Place area (and in a lovely restaurant recommended by same kind person). It is so close to the hub-bub but is never overwhelmed. I love Brussels and this area. Interesting, but sadly rather empty and unfurnished ! I quite agree, it looks definitely empty and unfurnished. One just hopes that the many other rooms instead are furnished. Yes I too was struck at how bare it looked,and also I didn't realise there was a throne room at the palace,which seems to have been set up for a conference. I'm not sure if there is an actual throne there, but anyway that's the way the room is called. IIRC it is used as the location for the concerts hosted by the Royal Family, especially the annual Christmas concert. And of course it was there that King Albert II signed his abdication in 2013. In the past, it was also used as the location for the civil wedding of Queen Baudouin and Queen Fabiola and also, if I don't mistake, for Queen Albert II and Queen Paola's civil wedding. No the Wedding of King Albert and Queen Paola took place in another smaller room. Sometimes also State Banquets are held in the Throne Room. Thanks for the correction, I had a vague remembrance about the exact room where it took place and wasn't sure about it. Instead, did Princess Astrid's civil wedding take place at the Royal Palace as well? No. Princess Astrid's civil Wedding took place in the Town Hall at the Grand Place ike for her brothers. The beautful Le Petit Salon Blanc at the Royal Palace of Brussels,I'm trying to figure out who the 2 portraits are of? The Royal Palace of Brussels is a wonderful place to be. The Royal Palace of Brussels will be open to the public from 22 July, with three new exhibitions: almost ready. I went into the Royal Palace two weeks ago at 6 pm for a Reception. If you are in Brussels please go , it is a must , entrance free , and high Security. The Palace is open to the Public until 11 ? of September , closed on Monday and attention last entrance at about 16 pm.